Friends, that crayon lipstick did indeed happen! The kid and I got the idea from Pinterest, and you may also know that I LOVE to test the veracity of the craft tutorials that I find on Pinterest, AND I love to share with you the ones that do. Not. Work. Ocean in a bottle? Does not work. Crayon candle? Does not work, although sometimes it does. The kid and I used two tutorials as the basis for our project, combining them a bit and modifying both. I’m just going to show you our mods here, as obviously I want you to link to the actual owners of the actual tutes if you want to make this yourself. So go check out Momdot.com’s two-ingredient crayon lip gloss, and Omghow’s Make Lipstick out of Crayons, and then come right on back here. Okay, since I wanted this project to be one that the kid could do independently, I set it up more like a science project than a cooking one, avoiding the stovetop entirely and using a candle for our heat source. The melting point for all of the ingredients is low enough for this to work. You’ll want a heat-proof, easy-pour container to use with a candle, of course, and that container is called a test tube. Grab a pair of tongs for the test tube, and a funnel for the coconut oil, and you’re all set up. Now, some of the tutes that the kid and I looked at called for petroleum jelly, and some didn’t. 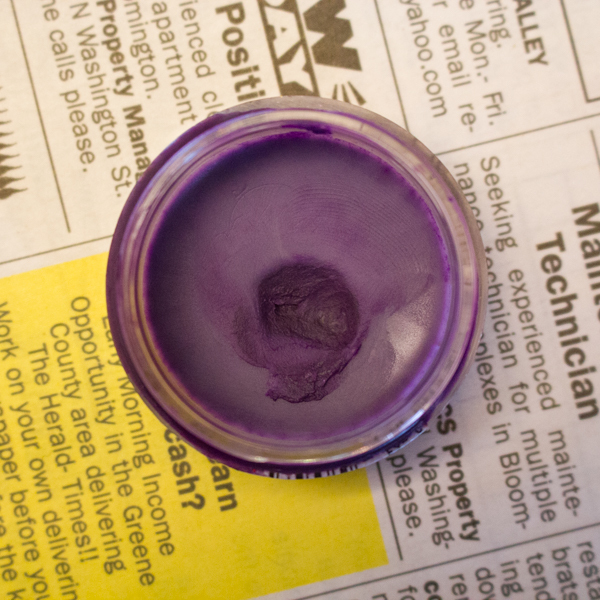 I NEVER use petroleum jelly for anything–might as well rub gasoline into your skin, amiright?–but I did want something that would bridge the gap between coconut oil and crayon, something that would be softer than crayon but stickier than coconut oil, to give the crayon lipstick a little bit more of a presence. That’s why I had the kid use just a pea-sized amount of straight beeswax in every batch, along with the coconut oil and crayon. We make a lot of rolled beeswax candles, so we have a lot of colored beeswax scraps that she could choose from, but even if you’ve just got natural beeswax, the amount that you use is small enough that I don’t think it’s going to matter. And leave it out if you don’t have it. None of the tutorials that we looked at called for it. I WILL say, however, that our lipstick turned out awesome, so there you go. Set up properly, the kid could make every batch of crayon lipstick completely independently. She spilled sometimes, obviously, but that’s why newspapers were invented. 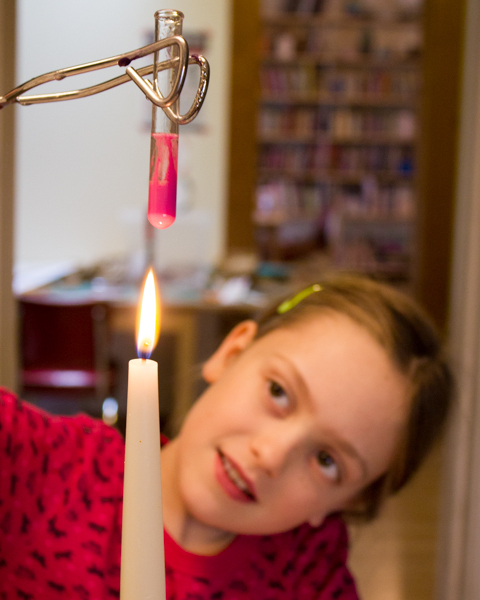 Her basic method was to add the crayon, beeswax, and coconut oil to a test tube, heat the test tube over a candle until everything looked melted and mixed, pour the solution into a small container, stir it with a toothpick, then pop it into the refrigerator to set for fifteen minutes. Working this way, the kid made seven different batches of crayon lipstick for her friend, and a couple of batches for herself, as well. To apply, just dig in your pinky and go for it! 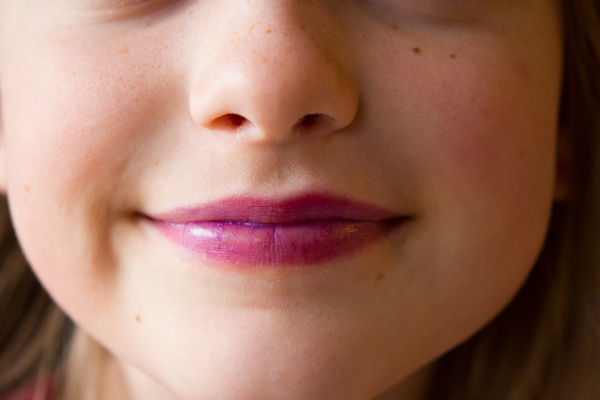 A little smear of crayon lipstick will go on like lip gloss, but a big ole pinky-full will give you a lot of saturation, and it 100% looks like lipstick. This is a good project because it calls for 1 inch of crayon per batch of lipstick, so it’s a great way to use up a few crayon stubs, while making yourself something cute. 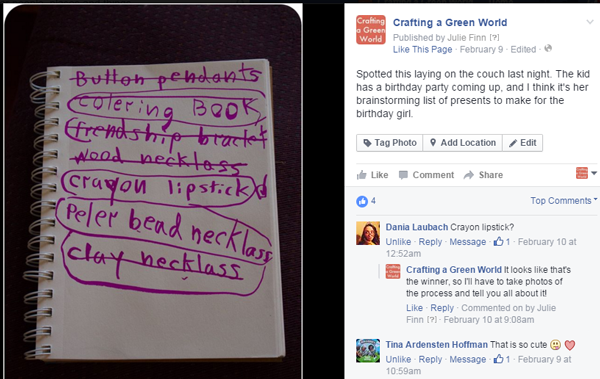 This is a bad project because crayons, while they’re non-toxic, certainly aren’t food. You don’t eat your lipstick, so I don’t think that you should eat this, either. If you’re looking for a more “natural” DIY lipstick, I suppose that it’s worth a try to play around with beeswax or soy crayons. But for a cheap, easy, quick way to make some fun make-up using natural and upcycled ingredients? Yep, go for it! I love this idea! I don’t know how I would feel about regularly applying crayons to my lips, but it would definitely be a fun thing to do with my daughter! And who knows, if you need an outlandish color for just one night then why not go for it? !